ASG President Emily Ash and Quest+ senator Stephanie Uriostegui speak at an ASG Senate meeting. Ash said a FGLI student center is important to creating a sense of community for FGLI students on campus. 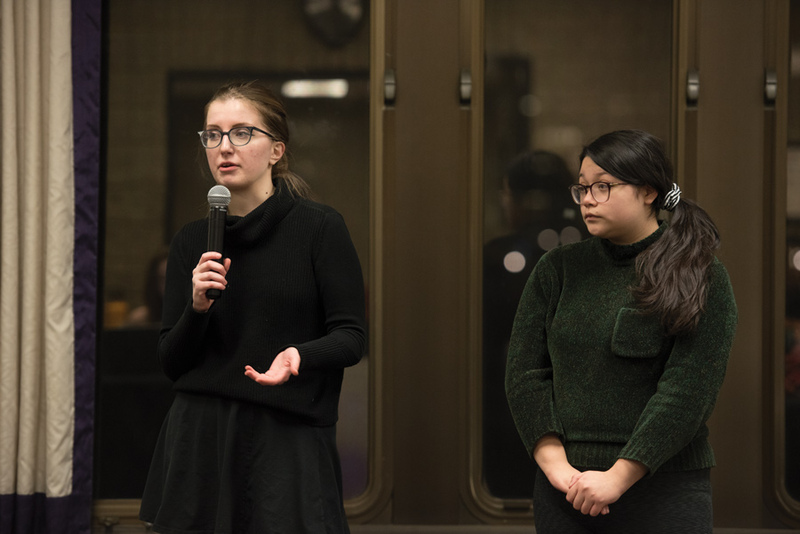 Associated Student Government introduced a resolution asking Northwestern to establish a first-generation and low-income student center during its Wednesday Senate meeting. The resolution comes in the wake of an open letter authored by the co-presidents of Quest+, Christian Reyes and Madisen Hursey, and ASG President Emily Ash. The letter outlined the necessity of a centralized building that can “enhance current social, financial and emotional support” for first-generation and low-income students, or FGLI students. The letter gathered over 300 signatures from students across Northwestern as of Wednesday night. Spaces for FGLI students and the University organizations that serve them are currently scattered throughout campus. Student Enrichment Services, which assists over 1,100 students, works out of a series of converted singles and a lounge in Foster-Walker Complex. The residential building is set to close for renovations in 2022, according to NU’s Housing Master Plan, adding urgency to the necessity of a new space, Ash said. Ash said the current setup hinders the operations of SES and other FGLI organizations, which need a larger and more permanent space. The resolution asks that administrators allocate one of the soon-to-be free houses on Sheridan road to serve as the FGLI student center, complete with office space, lounges and classrooms. The University has said it plans to move many of the academic and administrative offices that are currently housed on Sheridan Road into the Donald P. Jacobs Center after it completes construction on the latter. Stephanie Uriostegui, the Quest+ senator and co-author of the resolution, said such a space is necessary given the number of organizations that exist to assist FGLI students, including SES, Purple Pantry, Quest+, Gates Scholars and Ryan Scholars. A centralized building, Uriostegui added, is also crucial to creating a sense of community. The resolution notes that many peer institutions, such as Brown University and the University of Pennsylvania, have already constructed expansive FGLI student centers. The University of California, Berkeley opened its Basic Needs Center on Monday. Northwestern has already demonstrated commitment to FGLI students by meeting its “20 by 2020” pledge, which seeks to increase the percentage of accepted students who are Pell Grant eligible to 20 percent, two years early. But the University still has a long way to go to increase inclusivity, said Weinberg senator Noah Scantlebury.